Renewable energy is a natural energy which does not have a limited supply. Renewable energy can be used again and again and will never run out. Renewable energy is derived from natural processes that are replenished constantly. In its various forms, it derives directly from the sun, or from heat generated deep within the earth. Included in the definition is electricity and heat generated from solar, wind, ocean, hydropower, biomass, geothermal resources, and biofuels and hydrogen derived from renewable resources. 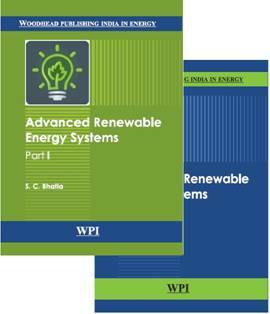 The book is a complete treatise on renewable energy sources and also includes issues relating to biofuels. It aims to serve as a text for the undergraduate and postgraduate students in relevant disciplines and a reference for all the professionals in the related fields. S.C. Bhatia, a Chemical Engineer from BITS, Pilani and also an MBA, is a consultant in Environmental and Pollution Control, Energy Conservation and Polymer Sciences.